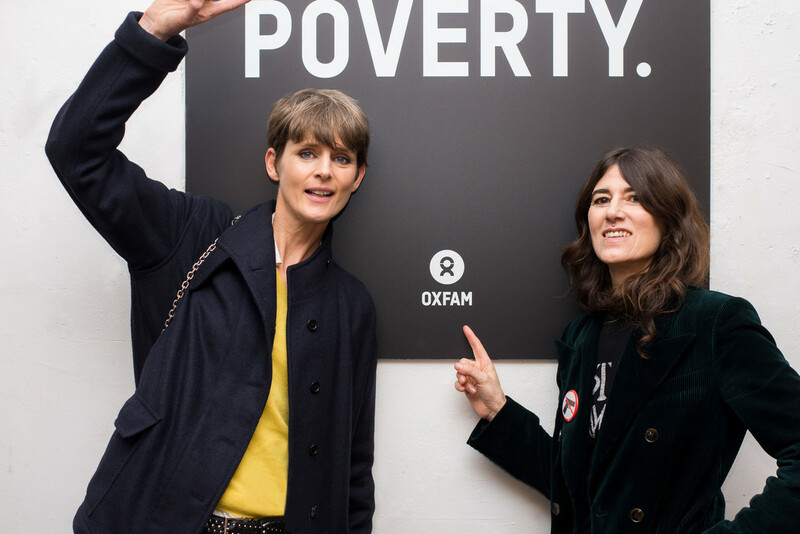 Models Stella Tennant and Bella Freud at Oxfam's fashion show last year. Top models Stella Tennant, Yasmin Le Bon, Laura Bailey, Lottie Moss and Kesewa Aboah, super-cool designer Bella Freud, and music stars Emeli Sandé and Una Healy are all scheduled to walk in a stunning Oxfam fashion show. Fashion Fighting Poverty is being staged during London Fashion Week, Monday 18 February, 7pm. It’s a ticketed event only. Guests will be treated to an extra special secret surprise! Bay Garnett, stylist, editor and consultant, famous for her flair with vintage and second-hand clothes, is styling the show in Oxfam fashion. With the House of Commons Environmental Audit Committee reporting imminently on fast fashion and the wider fashion industry, interest in sustainable fashion has never been higher. Oxfam fashion is sustainable – it slows down fast fashion by giving clothes a second chance to be sold and prevents them going into landfill. Oxfam works across many areas of fashion: we collaborate with big brands to recycle and reuse stock; we’ve joined forces with fashion houses to improve conditions in their supply chains; we fight to improve garment workers’ rights; and we campaign on climate change. All the models will showcase Oxfam clothes, which Bay selected from the Oxfam Online Shop and Oxfam high street shops. All profits from Oxfam fashion sales fund Oxfam’s work fighting poverty and suffering around the world. “The clothes in Oxfam shops really do transform lives. A £10 dress can provide clean water for 10 people in an emergency. The outfits created by Bay illustrate beyond a shadow of doubt that our affordable, stylish clothes look incredible. Even better are the beautiful things they do, which is save lives and slow down fast fashion by giving clothes a second chance to be sold and prevent them blighting the environment in landfill. So, it’s clearly perfect shopping sense to buy our fashion! · Fashion Fighting Poverty is Monday 18 February, 7pm at Ambika P3, London NW1 5LS. Prompt start. This is a ticketed event only. Contact oxfam@awandc.com for tickets. · Make-up by Rebecca Wordingham. Born in Paddington, London, Rebecca grew up surrounded by creativity, with her mother a BAFTA-winning make-up artist and father an executive producer within TV commercials. During her time studying Photographic Arts at Westminster University, Rebecca undertook a make-up course at her mum’s make-up school The London School of Media Make-up, and after graduating from Westminster decided to undertake a career within this field, assisting Lucia Pieroni, Thomas De Kluyver & Maki Ryoke whilst pursuing her own freelance projects. Joining Saint Luke in 2014, Rebecca’s attention to detail, eye for colour and use of textures & prosthetics within her work has earned her a renowned reputation within the fashion industry, with her work featured in editorial titles such as Document Journal, i-D, The Gentlewoman & Dazed & Confused and commercial clients including 3ina, Adidas, Barbour & Topshop. Alongside her editorial work, Rebecca is also beauty editor for Moodboard Magazine, Creative Director of London School of Media Make-Up & regularly works on shows over fashion week including Roberta Einer, Palmer Harding & Sadie Williams. · Hair by Philippe Tholimet. Philippe grew up in Melun, a small town near Paris, where he began hairdressing at the age of 15 for a Saturday job. After studying hairdressing in Paris and working with hair master Jean-Marc Maniatis, Philippe worked on his first show for Jean-Paul Gaultier, where he experienced his first taste at session styling. After moving to London to focus full-time on his freelance work, Philippe began assisting high profile hair stylists over fashion week before taking the decision to focus solely on his work in 2014 & subsequently joining Saint Luke in 2017. · Birdgang. Led by Simeon Qsyea, Kendra Horsburgh & Ukweli Roach BirdGang ltd is a London based creative company that creates avant grade dance content for stage, theatre & film. Birdgang ltd tells thought-provoking stories and paints vivid and striking images that challenge social stereotypes with an aim to create positive social change. Guided by the ethos that dance, like all art forms must use a knowledge of It’s past, fused with the present to shape the future. Their mission is to demonstrate that there is an evolving Hip Hop culture of great artistic and intellectual depth that influences the creation of multi disciplinary work across the contemporary arts. https://www.birdgangltd.com. Simeon Qsyea’s roots are in the theatre as a director and choreographer working with companies from acting, dance and circus backgrounds. His dream came true when he had a chance to work with the well-established physical theatre company DV8. Simeon’s other theatrical work includes collaborating with Lenny Henry at the National Theatre, Dynamo the magician, Cirque Bijou, Bela Kinetic, Cirque el moi, Breakin Convention, SK Shlomo, a Company of Elders amongst a range of theatres all over the world. Most recently Simeon worked on “Magnificent melodic Machine” (O2), which was off the back of another circus production “Pop” (at the Round house). This year Simeon has been back in the creation lab directing and choreographing “Stripped” a theatre show starring Celebrity Master chef winner John Partridge. · Oxfam fashion fights poverty: Every garment sold in Oxfam’s shops on the high street and online helps beat poverty. One dress could raise enough money to provide a woman in Bangladesh with a safe bathing cubicle, a shirt could provide safe, clean water for ten people in an emergency, and a coat could help train two farmers in Rwanda to better cope with extreme weather conditions. Last year Oxfam shops raised almost £19 million for our work fighting poverty around the world – that’s life-changing. · Oxfam fashion is sustainable: We’re part of the solution to fast fashion because we give clothes a second chance to be sold and prevent them ending up in landfill. Our pioneering recycling hub Wastesaver saves more than 12,000 tonnes of clothing from going into landfill every year. · Oxfam is a global movement of people all working towards the same goal – an end to the injustice of poverty. Together we save and rebuild lives in disasters, help people earn a living, and speak out on the big issues, like inequality and climate change, that keep people poor. Join us! For more information and interview requests, contact Emma Fabian on 01865 47 2193/07825 503 274, efabian1@oxfam.org.uk.